Wishing you a Merry Christmas season! It's a good time to remember that Christ came to earth as a baby to provide a way out from our death penalty from sin. What an awesome God we have! 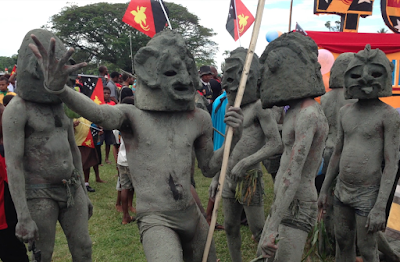 We have seen nothing here, in this part of PNG, to remind us that Christmas represents Christ birth. Here, what little reminders of Christmas there are, is all very commercial; nothing more. As we wrap up 2014 we have lots to be grateful for. God has done so much for us and through us here in PNG. We feel truly blessed. So many of you have been praying for us, and the project here; and many have also supported with funds and gifts. For all of these, we are truly grateful. Our prayer is that God will repay you many times over and that the New Year will be a good one for you. This week the phone company here delivered the parts for a cell tower to be installed about a ¼ mile from our house and its suppose to be 3G, so hopefully we will have phone and email service here in Bewani in the next month or so! This will now make it possible for the health department and other villages to notify us when there is a medevac at some other village. They are installing several other towers in the area we plan to serve. What a blessing that will be! If you or someone you know is an IA airplane mechanic and would like an adventure and to do some traveling, we need an annual inspection done on our C182 here the end of April-first of May. Let me know if you might be interested. 15 people were baptized here in Bewani a week ago. That was the first baptism here in several years and it was really neat. We gave the candidates Bibles after their baptism. We are trying to encourage them to have baptisms much more often. Sometimes the hardest part is to get the ball rolling. The pastor is planning on another baptism at a nearby church in another week. It has taken a lot of work and encouragement to get this far. Looks like we are finally getting some movement on the paperwork for the plane! We will report on that when we have something solid. Thanks again for being a part of this ministry with your prayers and donations. They do make a difference! We really enjoy hearing from you as well. It is on You Tube under "lostlambfound" or on blog site www.lostlambfound.squarespace.com It was produced by our friend Darah Varga. We still need several more sponsors for our new "adopt-a-missionary" program. May your home be filled with blessings this Christmas season. Please include a note: "PNG project"